While working on the Bird�s Nest Treehouse, which is largely in harmony with its surroundings, the idea of creating an entirely different environment was born. And what could be more different than an UFO? The room is cast in durable composite material � all to create the lightest, yet strong and sustainable design possible. The interior gives the room a modern and comfortable feel over two floors. 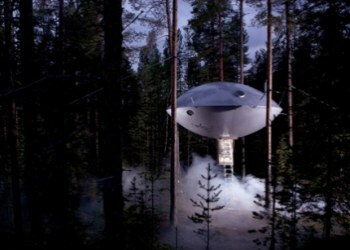 The UFO is built for four people, two adults and two children, with separate bedrooms, bathroom and living area. 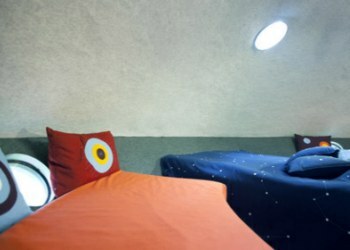 30m� is all you need for a comfortable escape to childhood dreams. Britta�s Pensionat is open for Treehotel�s guests, serving breakfast, lunch and dinner in an authentic 1930-1950�s setting. There�s a restaurant, bar, sauna and relaxation area, TV, and internet. When you arrive at Treehotel, you first check at Britta�s pensionat; then it�s a short stroll through the breathtaking nature to your treeroom. Irrespective of age, gender, faith or ethnicity, nature appeals to and awakens something in all of us. Is it the beautiful, dark winter with its stark contrasts of black skies against sparkling white snow that appeals to you? Is it an action-packed dog sled ride through the frozen landscape, or perhaps the calm and quiet experience of a snow shoe walk in pursuit of the magic and myth of the northern lights? Paddle down the Lule River in a kayak through a brilliantly coloured landscape and marvel at the clean, crisp air that the autumn winds bring. Nature wakens quickly after the long sleep of winter, the trees come into leaf and the ice releases its cold grip on rivers and streams. The arrival of summer and its light nights is wonderful to experience on horseback, on foot or by mountain bike. Here at Treehotel you can experience the charm of all four seasons, whether you prefer speed and adventure or quiet time for reflection.